Fix Broken Volume Keys with Volume Chopcut app. Smartphones, no matter how they are great, carry the risk of being damaged. Accidentally drop your bag and you might have to buy a new one. Even if you keep it with care, it is possible that it could be damaged. One of the most frequently encountered by users of smartphones problem is that the hardware buttons stop working and they do not know the reason. Earlier, I shared what to do if your smartphone power button stops working, in this article I’ll tell you how to take control of the volume of your android smartphone when its volume buttons stop working because when it comes to Android device there is hardly a part that can not be solved, modified and improved. see also: 8 Secret Ways to Manage Your Android Apps. 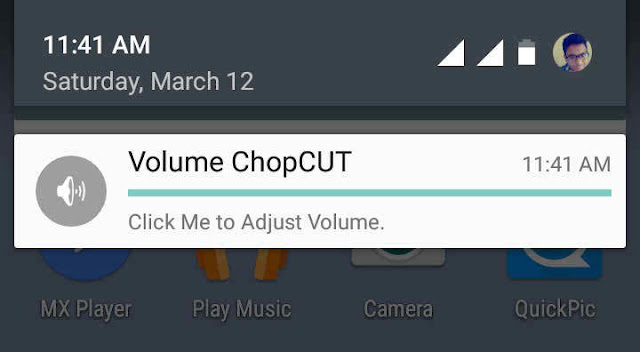 For the power of the volume buttons, we’ll use an application called Volume ChopCUT apk. So what this app does is that it takes the functionality of your buttons and transfers on the broken volume screen. Take it like this – earlier, we hardware buttons for home, back, and recent applications, but now all the functions of the hardware buttons were put on the screen. 1. The basic notification: This option is very light because it adds a single persistent notification in the notification panel and you can assign a function (volume volume / alarm / call volume / ringer volume media ) to her. Several functions may also be affected, but only one line will be used in the notification database option. Voume Chopcut Extended Notification feature. 2. Extended Notification: This option also adds a persistent notification in the notification panel, but it provides extensive control over the basic notification. To make the process easy, it adds built up and down buttons for volume control. 3. Floating Equalizer: This is an experimental feature that gives you access to EQ via the floating button. 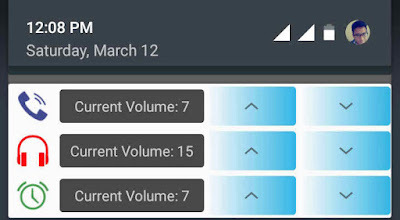 Other than all the above options, you can also integrate with Google Volume ChopCUT now and you will be able to control the volume through voice commands. To do this, you have to give him access to accessibility settings. 4. Floating Widget: As the name suggests, this option adds a widget that floats on the screen and can be dragged anywhere. This widget draws over other applications so that it will always remain above all other app.Tapping on the widget gives access to volume controls for the media, alarm, ringtone and call. It has a number of icons to choose from for the widget. Icon size and transparency is customizable. Download Volume ChopCUT app from Google Play store. Have you ever faced such a situation? Did you find this useful workaround? Do you have another tip or trick to control the volume, although the volume buttons do not work? Tell us in the comments section below.